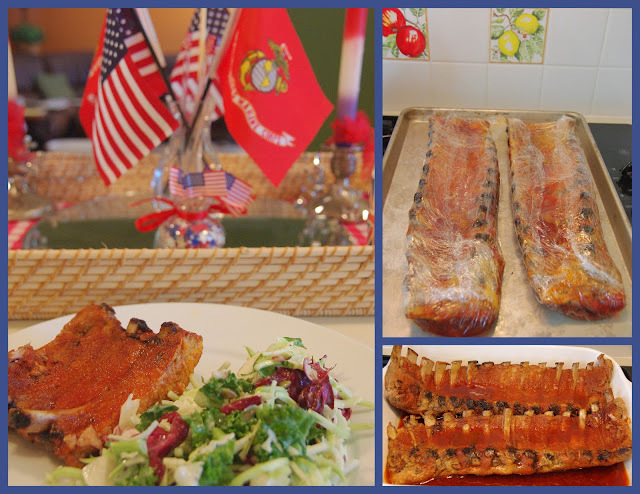 Happy Fourth of July U.S.A.! I tried a new method to make slow roasted pork ribs and was very satisfied with the ease of the method and the final product. The meat falls off the bones. I made my own rub and the ingredients are listed below. Mix all the rub ingredients together well. 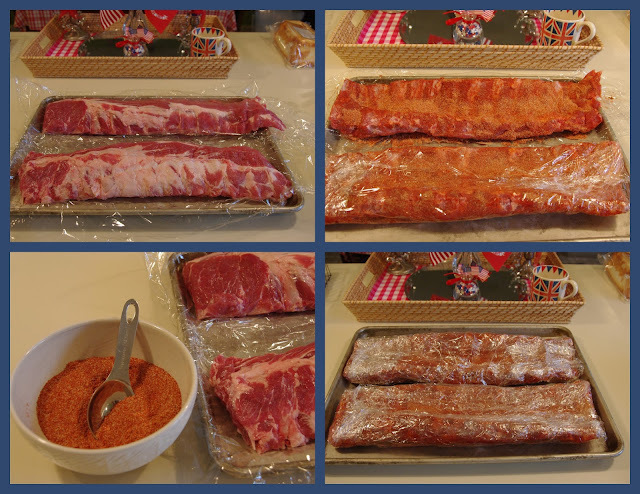 Using all the rub generously coat both sides of the ribs. Wrap the ribs securely with plastic food wrap. Place in preheated oven for 3 hours or longer. Remove from oven and let them sit for 15-20 minutes. Serve with your favorite barbecue sauce if desired and side dishes of your choice. We enjoyed them without sauce. Note: There are different answers about the safety of using plastic food wrap in the oven. Some say up to 400 degrees is OK and some say only up to 375 Degrees. The plastic food wrap worked well at this low temperature. For those of you visiting our site from the United States we'd like to wish you a very celebratory and Happy 4th of July! Those look delicious. I am going to give them a try. The salad looks delicious as well. Is there a recipe here for that? Have a great week. Looks delish Ellen! Happy 4th to you and yours!!! Plastic wrap??? Seriously?? Why not use a plastic cooking bag that's meant for the oven?? I have never heard of using plastic wrap in the oven. Do you use a special type of plastic wrap? Looking forward to your reply. yes, i also want to know about the plastic wrap. thinking i'd use foil instead. ***I was surprised by the use of plastic wrap also. At this low temp I wouldn't hesitate to try it. The ribs look so good how can I resist!! I do somewhat the same idea from from Emeril Lagasse, using 3 layers of plastic wrap followed by heavy duty foil, same oven temp and time. Anytime I've done it the plastic falls apart around the ribs, which is luckily contained by the foil. I'm surprised your plastic doesn't do the same. We just had some today. As you say the meat falls off the bone it's so tender. I bet you could use foil or parchment, too? 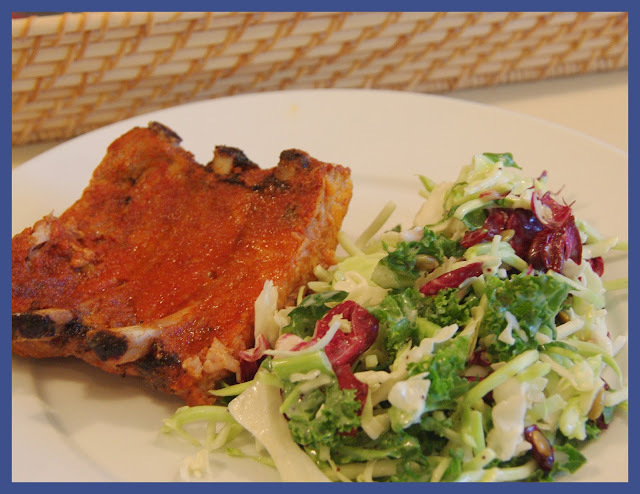 Thanks for the recipe finally a delicious and tender rib...soo good! Hubby used your rub on a slab of ribs he grilled for our dinner tonight.... absolutely wonderful, he grilled at 250 to 325 degrees on a gas grill. The ribs were fall apart tender, and the rub is great. Love summer dinners on the grill. Thank you, for posting such a great recipe.